Clash detection is a popular term among AEC firms. It is 3D graphic that permits for the inherent exposure of inconsistencies in early phase of the design. Detecting inconsistencies is very important, as these can provide serious effect on the construction progression, result in delays, design modifications, materials costs and budget overruns. The constructability issues are solved in earlier stage of construction and it saves huge amount of money, time which lead to creating a superior building. Clash detection is a part and parcel of the BIM modeling system. In BIM modeling process, there is not a single model but various models are incorporated into a combined master model. Each discipline ranging from structural engineering, MEP engineering, environmental engineering, etc makes a model independently on the basis of the architect’s original model. It is the starting point for all the other disciplines. 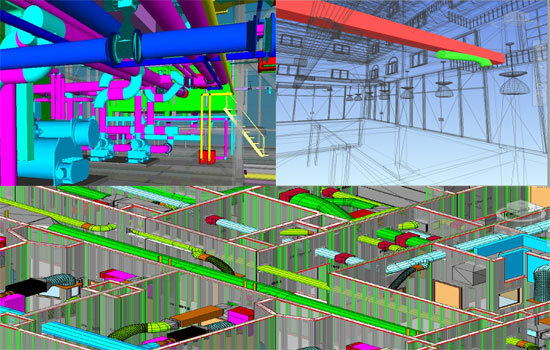 Once each of the disciplines completes their work, the next stage in BIM modeling is clash detection. Therefore, clear conception on clash and how to apply clash detection factors in BIM software is vital for engineers, architects, owners and contractors. It is found that each recognized clash saves $17,000 approximately on a project. Clash detection is also considered to be an effective teaching tool that facilitates the students to find out prospective mistakes devoid of spending wasteful time searching through 2D drawings. Hard Clash: A hard clash occurs when two objects take up the identical space. For example, a beam is going through where a plumbing run is designed. As information is implanted in the BIM modeling objects, hard clash provides geometry based detection as well as semantic and rule-based detection algorithms. Geometry based clash detection will restore a clash for every recessed ceiling light, or a pipe going through a wall. But if clash detection rules are created on the basis of embedded object data, it can reduce these types of general errors. The level of detail and selection sets plays an important role in BIM modeling for the accurateness and effectiveness of clash detection by performing clash detection amid definite subsets of a model. Soft Clash: Soft clashes denote objects that require positive spatial/geometric tolerances, spaces and buffers inside their buffer zone for access, insulation, maintenance or safety. Soft clashes create new possibilities where BIM modeling clash detection brings new potential to the method. Custom “soft clash” detection can be applied for testing components for building code adherence. 4D/Workflow clash: 4D/Workflow clash detection can determine scheduling clashes for work crews, equipment/materials fabrication & delivery clashes and other project timeline issues through a BIM modeling project.